In a mausoleum in Moscow's Red Square, Lenin's mummy lies on a red silk bed in an ornate glass sarcophagus. The eyes of the one who was Vladimir Ilyich Lenin are imprisoned, his hair is combed and the mustache carefully arranged. The former Bolshevik leader is dressed in a modest black suit and his arms rest on one side and the other. Even at the age of 94, Lenin's mummy seems so alive that it is said to often frighten young children. The secret procedure that keeps Lenin's mummy so well preserved remains shrouded in mystery to this day. At first glance, many assume that the body is made of wax. But it is the true and impeccably preserved body of the Bolshevik revolutionary. How has Lenin's mummy resisted so well for so long? All internal organs were removed and only skeleton and muscles were left. The body is periodically refilled and carefully guarded, from the day Lenin died, by a team of loyal specialists. Lenin died on January 21, 1924, and his original plan had been buried. At first, he was embalmed only temporarily to prevent decomposition. Then, after a four-day funeral ceremony, during which tens of thousands of people fought the frost and came to honor his memory, Lenin was to be buried. But it seems that four days were not enough for the mourners. The officials and foreign citizens wanted to salute the corpse of the deceased leader with respect. So the Soviets decided to build a temporary wooden mausoleum. Lenin's body was deposited inside. Thanks to the low temperatures, varying between -7 and -6 degrees Celsius, Lenin's body remained almost in perfect condition. After 56 days, Soviet officials decided not to bury him and began to weigh the possibility of permanently conserving the body. Low temperatures had preserved Lenin's body until that moment. Thus, the initial plan was for the Bolshevik leader to be frozen. Minister of International Trade, Leonid Krasin, was given permission to search for special refrigeration equipment in Germany. But before they started looking for it, two chemists suggested the embalming version. Vladimir Vorobiov and Boris Zbarski argued that the freezing of the corpse would not be a permanent solution, because it would decompose anyway over time. They argued that a special chemical cocktail could be injected into the body to completely prevent the change in color and shape, as well as drying and decomposition. This practice had already been tested on several bodies and had been successful. So, considering the coming spring, the government agreed to embarrassment. However, Lenin's body had already suffered irreversible injuries. There were black spots on the skin, and the orbits of the eyes began to deepen. Therefore, before the Bolshevik leader was embalmed, scientists spent months brightening the skin and preparing the blend of chemicals that are ideal for embalming. After nearly eight months of work, they have created a substance whose composition remains shrouded in mystery to this day. Finally, the corpse could be preserved, and the Red Square mausoleum was again open to the public. At present, the group of scientists who keep Lenin's mummy in proper condition is known as the "Lenin Lab". These scientists visit Lenin's mausoleum every few days. They are careful that light and temperature carefully calculated to ensure perfect conditions for preservation. 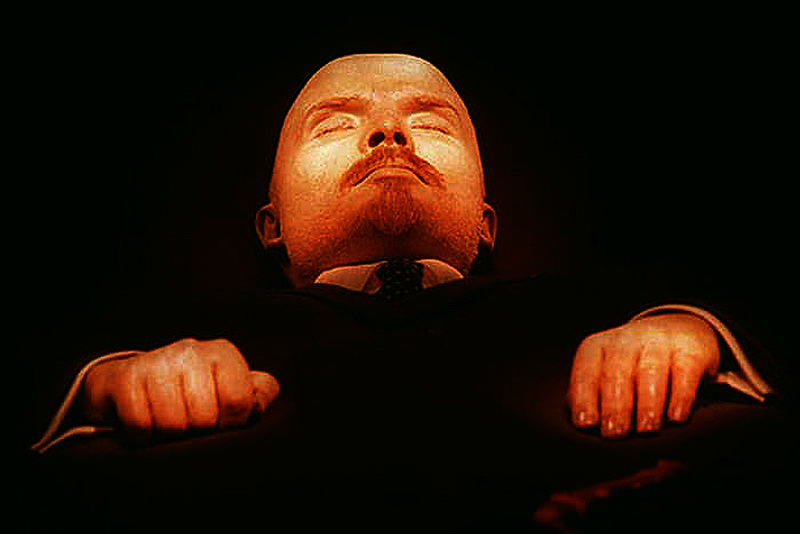 Every 18 months, Lenin's mummy is transferred to a special complex, located below the mausoleum, and is re-embalmed. There, the body is washed with embalming fluid and injected with the required chemical mixture. Despite the fact that it is almost perfectly preserved, there is no internal organ in Lenin's body. The skeleton, the muscles, the skin and some of the connective tissue remained, but the organs were removed shortly after his death. The former Bolshevik leader's brain was taken to the Center of Neurology of the Russian Academy of Sciences. The brain has been studied many times to find out more about the leader's "extraordinary abilities". The scientists who are part of Lenin's Laboratory also ensure that Lenin's mummy has a natural look. They check the joints and the position of the limbs. They also monitor the condition of the skin and periodically replace the disintegrating tissue with artificial material. In addition to these measures, any other revolutionary procedures to be used on Lenin's mummy are first tested on "guinea pigs". These are unidentified bodies kept in the laboratory. The success of preserving the corpse has made several states ask for the help of Lenin's Laboratory. Among the "clients" are Vietnamese President Ho and Min, Bulgarian leader Gheorghi Dimitrov and former North Korean leaders, Kim Ir-sen and Kim Jong-il. Although other states have taken part in conservation operations, Russian scientists have yet to divulge their secrets. The work of these scientists is shrouded in mystery. After the break-up of the Soviet Union, there were many voices who demanded that the Bolshevik leader be buried and the mausoleum destroyed. But after several protests that took place in Red Square, Russian leaders decided to keep Lenin's mummy. Currently, the corpse is kept in "Lenin's Laboratory" and is monitored more carefully than ever. The body is periodically exposed to the mausoleum and continues to have a sinister appearance of freshness, just like in the past 94 years.